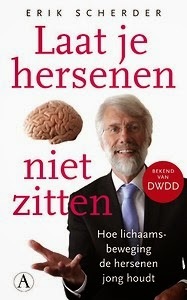 Erik Scherder is a Dutch neuropsychologist who has recently written a book called Laat je hersenen niet zitten. A literal translation of the title would be something like Don't let you brain sit down but what it actually means is something like Don't neglect your brain. As far as I know, the book has not yet been translated into English. The book is about the great importance of physical activity for our brain health. That physical activity is important for keeping your body healthy should not come as a surprise. But what may be a surprise is that it is also quite important for the healthy development and functioning of the brain. Scherder explains that we, mainly because due to the availability of all kinds of technology, have become less and less physically active. According to him, this physical inactivity is an assassin which kills as many people as smoking. Physical inactivity is not only associated with health problems such as cardiovascular disease, diabetes, and cancer. It is also associated with mental health problems such as decreased alertness, loneliness, poor impulse control, lack of initiative, anxiety, grief, pain, chronic stress, dementia and depression. Scherder does not argue that we should all get a gym membership or should start preparing for the next marathon. On the contrary. He advocates that we start being moderately intensively physically active for at least 30 minutes per day (without skipping a day). Walking may be the best way to do this. It does not require any special devices, it does not cost anything, it does not look silly, and you can easily regulate the degree to which you strain yourself. Walking, and other forms of physical activity such as swimming, cause certain brain circuits to function better such as the ventromedial prefrontal cortex (vmPFC) and the hippocampus by (1) increasing neurotrophine levels, (2) forming longer and more complex dendrites, (3) improving blood circulation, and (4) an increase in the number of neurons in the hippocampus and other brain structures. By the way, you probably already knew that walking and swimming are healthy activities. But did you know that chewing is also quite healthy? Scherder devotes an entire chapter to the health benefits of chewing (better cognition, pain-killing, stress reduction). Scherder further explains that the combination of physical activity and engaging in enriched environments (environments which are challenging, complex and new) works well. He mentions the work of neuroscientist Kempermann who says that physical activity plays a role in the production of precursors of new neurons and that engaging in challenges causes new neurons to survive and make connections with other neurons. In one chapter the author discusses the effects of physical effects on diseases and disorders such as ADHD, autism, intellectual disability, Alzheimer, vascular dementia, Parkinson, and multiple sclerosis. He concludes that (1) far too little research has been done in many of these areas, (2) the findings on the effects of physical activity are inconclusive, (3) that in many cases there are positive and negative effects at the same time, (4) that the positive effects which have been found do not affect all cognitive functions but only some of them. The positive effects of physical activity, he concludes, appear to be strongest for people who are inactive and who do not (yet) suffer from diseases of the central nervous system. I think this is a wonderful book which should be read by both the young and old. I hope there will be an English translation, soon.